Dan Metz is a writer and journalist working in the NYC and Greater Philadelphia area. See more of his work by clicking here. Why is this night different from all other nights? Because tonight we get to talk about NBC’s “The Good Place” at the seder table. If you haven’t watched at least the first season of the show, take this time to log into your friend’s cousin’s Netflix account and watch it. All caught up? Good. The Good Place (TGP) follows four individuals as they try to connect with an experience they don’t fully understand. Chidi’s puzzled by the rules, Eleanor’s struggling to find a way to care, Jason wants to know what’s going on, and Tahani realizes that she never even knew where to begin. 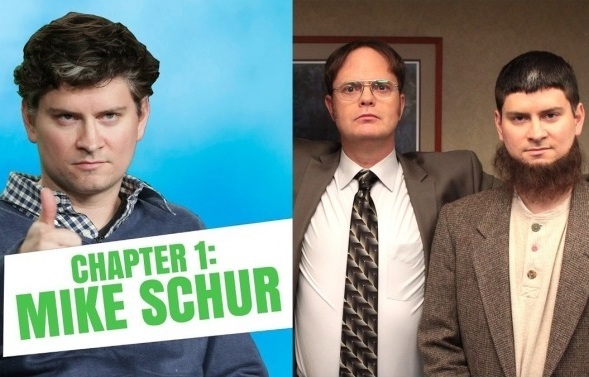 Maybe some of you have guessed where this is going: in writing the core cast of TGP, showrunner Michael Schur has perfectly embodied the four children of the Passover seder, and in doing so has given us something new to learn about each. The story of the four children comes from four quotes taken from the Torah. Each quote --three from Exodus, one from Deuteronomy-- describes a way in which someone should explain the exodus to their children. There is the Wise Child, the Wicked Child, the Simple Child, and the Child Who Doesn’t Yet Know How To Ask a Question. Take a moment to guess which character is which. Ready? Were you to ask Schur, an Ashkenazi Jew from Ann Arbor Michigan, he would probably call Chidi the wise child, Eleanor the wicked child, Jason the simple child, and Tahani the child who doesn’t yet know how to ask. Of course, I’ve never sat down at the Seder table with the man, (Michael, if you’re reading this, my seder plans are flexible) but I have a good hunch. But the Haggadah pairs Wise with Wicked and Simple with Not Knowing. Schur has paired his four characters just like the Haggadah, linking Chidi with Eleanor and Jason with Tahani. Like the wise child, Chidi seeks to know all of the rules and regulations and tries to follow them all even if they contradict or make every choice impossible. As soon as a problem arises, he’s summoned a dozen books and a chalkboard so he can learn everything he can, even if he isn’t going to do anything about it. It is, in some ways, the only thing he is active about. The Haggadah seems to praise the wise child and rebuke the wicked one, telling the latter that, if she’s going to challenge the traditional meaning of the holiday, then she can’t be part of the group. Looking at Eleanor as an example of a wicked child, we find someone who already feels like an outsider. When we look at Chidi as a wise child, we see someone who always seeks more information because he’s afraid to act. As Rabbi Soloveitchik puts it, “We are not asked to knock out the wicked child’s teeth but to dull them, to disprove and reject his arguments. We do not ignore him but convince him of his error and bring him back to the fold. It is a task that requires more than one night.” And who would best benefit from working with the rebellious wicked child? Who has a love of learning strong enough to “dull their teeth”? Michael Schur knew the answer. This one’s tricky. At first glance, it seems obvious that Jason, whose school was a junkyard where he learned how to sell magazines, would be the one who doesn’t know how to ask a question. He probably hadn’t even heard of “ethnics,” as he called it, until Chidi’s class. But maybe the simple child at a seder hadn’t thought to ask about it until they’d sat down at the table. Jason might not always have the answers --in fact, hardly ever--- but he still tries to figure out what the fork is going on around him. Tahani Al-Jamil: Socialite, celebrity wrangler, and the most self-diluted person in the show. At least at first. Any effort to correct her course would force her to admit her own ignorance, which she was raised to believe was the worst thing she could do. She spent much of the first season pretending things weren’t going wrong, leaving her the last person in the group to join the ethics class and finally begins to finally ask questions. Like with the wise and wicked children, this interpretation flips the original on its head. The child who doesn’t know to ask might be almost as well-educated as the wise child, or more so. The simple child who does ask might be encountering Judaism for the first time. In the case of Tahani and Jason, Tahani’s walls only started coming down because she started hanging out with someone who wasn’t afraid to admit ignorance. If Schur intentionally built his characters off of the four children in the Haggadah, he hasn’t mentioned it anywhere. Like Michael says aboutThe Good Place at the beginning of Season 1, the show seems like it takes about 5% from every faith. Perhaps we’ll find out this September when Season 4 rolls around. In the meantime, it’s worth some pondering, and maybe the chance to watch an episode at the seder table. For more of Dan Metz’s work, click here.